This sample associate agreement contains terms of a typical employment relationship between a law firm and an associate. Having a written agreement can help make sure that the rights and obligations of both parties are discussed and agreed upon at the start if the relationship. This can help avoid problems later. This document is a supplement to practicePRO’s Managing the finances of your practice booklet. This document was originally drafted by the Law Society of British Columbia, and is reproduced with permission. 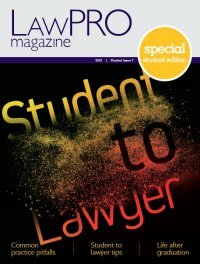 LAWPRO gratefully acknowledges the work the Law Society of British Columbia did in preparing this document. Model agreements are provided by LAWPRO for your consideration and use when you draft your own documents. They are NOT meant to be used “as is”. Their suitability will depend upon a number of factors. This document may need to be modified to correspond to the specific arrangements you have made.